Sister Elizabeth feeds Yoda, a water buffalo calf at the ranch. The nuns bought the buffalo to make mozzarella. The farm buildings sit in the shadow of the main Abbey of St. Walburga, all tucked in a stony valley. Sonja Salzburg for Harvest Public Media. 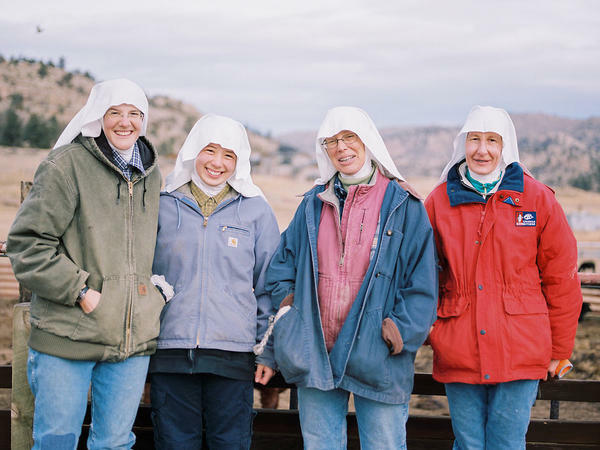 Benedectine nuns blend work and prayer on a farm run by the Abbey of St. Walburga near the Colorado-Wyoming border. From left are sisters Maria-Gertrude Reed, Ann Lee, Maria-Walburga Schortemeyer and Elizabeth Baumgartner. Many beer aficionados are familiar with the rare breweries run by Trappist monks. The beer is highly sought after, but it's not the only food or drink made by a religious order. Many abbeys and convents have deep roots in agriculture, combining farm work with prayer. Just 5 miles south of the Colorado-Wyoming border you'll find one of these places. Idyllic red farm buildings sit in the shadow of the main abbey, all tucked in a stony valley. At the Abbey of St. Walburga, cattle, water buffalo and llamas graze on grass under the watchful eye of Benedictine nuns. Sister Maria-Walburga Schortemeyer runs the abbey's ranch. Other sisters volunteer their time to work. The list of agricultural activities is long. In addition to the cows and llamas, the nuns raise chickens and bees, most of which are used in the abbey's kitchen. The water buffalo are the newest addition, brought on in April and milked to make mozzarella cheese. But because the sisters need a health certification for their operation, the cheese-making is currently on pause. The biggest moneymaker on the farm comes from the beef cattle. The sisters are very aware of their marketing edge, Schortemeyer says. "We have kind of a corner on the market — you know, nuns selling natural beef. People just kind of believe in it," she says. They've been in the grass-fed beef business now for about seven years. Because their operation is unique, so they've never had a problem selling out of their product. "Some of our customers want it because of the beef," Schortemeyer says. "Some of them want it because they know how [the animals are] being cared for. We didn't have much trouble, and now we always have a waiting list for the beef." "We have seen them chase a mountain lion off the property," Schortemeyer says. "Llamas have various weaponry. One of them is their breath. They also kill with their front feet. They try to disembowel you — if they were upset with you." When many religious orders were founded centuries ago during the Middle Ages, agriculture was more than a way of life; it was a way of survival. Monasteries were self-sustaining, growing the food they ate. While farming has become less common as society has urbanized, Schortemeyer says the abbey's farm is more than just a quaint business. Other sisters have questioned the ranch's value, but Schortemeyer says it keeps the sisters connected to the outside world. "When our neighbors are suffering from drought or suffering from flooding, we can totally relate to them. We're not above and beyond. ... It's good to be at the mercy of the environment, and so that other people know we don't live some ethereal life," she says. Benedictine monasteries, with orders like the Trappists and Cistercians, use the motto Ora et Labora, meaning prayer and work. That motto doesn't represent separate ideas to the sisters. All day long, prayer and work are intertwined. "Praying with the scriptures is like chewing your cud," Schortemeyer says. "So all through the day, we're ruminating on it. We chew, chew, chew, swallow, regurgitate. So it's not just 'the Lord is my shepherd,' it's 'the Lord is my cowboy.' "
Seeing their simple farm clothes of plaid shirts, jeans and Carhartts, it can be easy to forget the women are nuns — save for the fact they still wear the familiar fitted white coif covering their heads. Back at the main abbey, Schortemeyer dons the traditional black and white habit. No more Carhartt jacket. With farm work done for the morning, it's time for prayer. It won't be long before they're headed back out to the ranch to round up some rogue llamas. Copyright 2015 KUNC-FM. To see more, visit http://kunc.org. 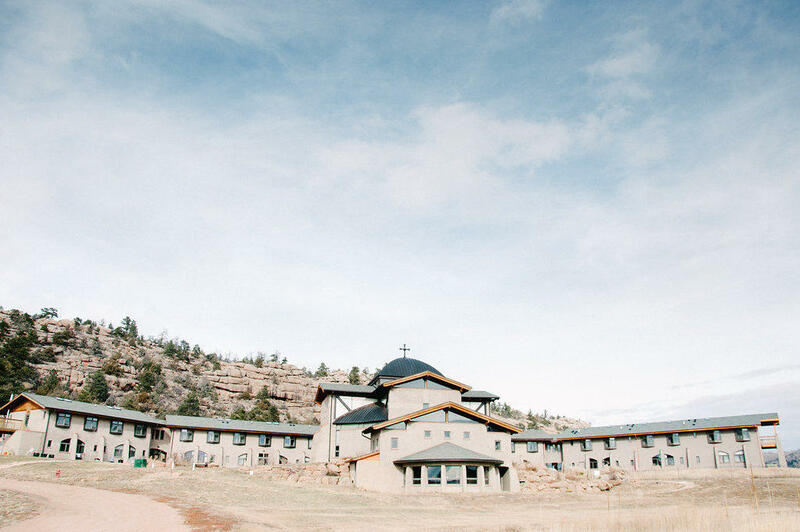 The nuns who live in the Abbey of St. Walburga in northern Colorado find their connection to God through prayer and cattle ranching. The small Benedictine community helps support itself through agricultural work, which also helps the nuns stay connected to the world in other ways. Luke Runyon from member station KUNC has the story. LUKE RUNYON, BYLINE: About five miles south of the Colorado-Wyoming border, a large stone sign points visitors down a gravel driveway into a rocky valley. Idyllic red farm buildings are just down the road from the main abbey, where 22 sisters live, pray and work. Three nuns step out of a retro Ford truck, dressed in simple white veils - oh, and in jeans, plaid shirts and Carhartt jackets. SISTER MARIA-WALBURGA SCHORTEMEYER: Hi, I'm Sister Walburga. RUNYON: Nice to meet you - Luke. 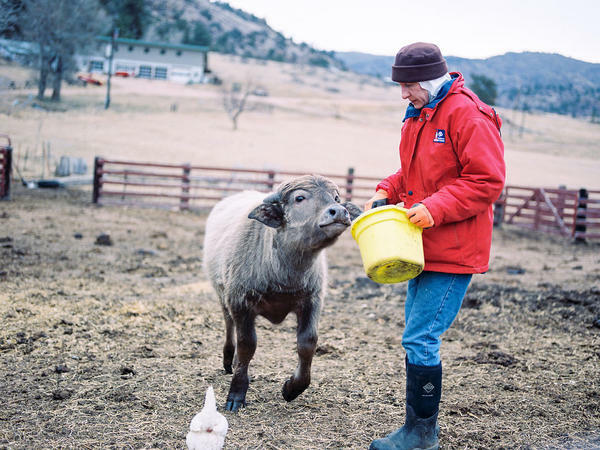 Sister Walburga runs the abbey's ranch, and the list of agricultural activities here is long. They raise llamas, chickens, water buffalo and bees, but the biggest moneymaker on the farm comes from the beef cattle. The money from ground beef sales goes to the abbey's coffers. And Walburga is very aware of her marketing edge. There's always a waiting list for new customers. SCHORTEMEYER: We have a bit of a corner in the market - you know, nuns selling natural beef. People kind of believe in it, you know? RUNYON: To keep the baby cows safe from the numerous predators, like bears, coyotes, mountain lions, the nuns employ an unorthodox set of security guards. SCHORTEMEYER: The llamas do have a purpose besides, well, baby calf protection. We have actually seen them chase a mountain lion off the property. SCHORTEMEYER: Yeah, yeah. That's why we have them. Llamas have various weaponry. (Laughter) One of them is their breath. They also - they kill with their front feet. They try to disembowel you. RUNYON: That's right - a disemboweling guard llama raised by nuns. SCHORTEMEYER: All the cows are going to come, sister. UNIDENTIFIED WOMAN: Here's Daisy taking the lead. RUNYON: In the Middle Ages, when many religious orders were founded, agriculture was more than a way of life. It was a way of survival. Monks and nuns raised the food they ate. Since then, we've become a lot more urban. Still, Walburga says the abbey's farm is more than just a quaint business. While some of the other nuns have questioned the ranch's value, she says it keeps the sisters connected to the outside world. SCHORTEMEYER: When our neighbors are suffering from drought or suffering from flooding, we can totally relate to them. We're not above and beyond. And it's good to be at the mercy of the environment, and so other people know, you know, that we don't live some kind of ethereal life. RUNYON: Most Benedictine monasteries use the motto ora et labora, meaning pray and work. But Walburga says there's no division between those two ideas. Prayer and work are intertwined. RUNYON: With farm work done for the morning, it's time for prayer. Back down at the main abbey, Walburga is in her traditional black and white habit. SCHORTEMEYER: Praying with the scriptures is like chewing your cud. All through the day, we're ruminating on it. So we chew, chew, chew, swallow, regurgitate, chew, chew, chew. RUNYON: After prayers and a quick lunch, the sisters will be back to work in their Carhartt jackets. SCHORTEMEYER: So it's not just the Lord is my shepherd. It's the Lord is my cowboy. RUNYON: And this afternoon's chore is to round up some rogue llamas. For NPR News, I'm Luke Runyon in Fort Collins, Colorado. GREENE: Luke's story came to us from Harvest Public Media, a reporting collaboration focusing on agriculture and food production. Transcript provided by NPR, Copyright NPR.